Add Sparkle To Your Desk With Crystalline Stylus Ballpoint Pens. Write or use a smart device in style with this sophisticated & stunning Crystalline Stylus Ballpoint Pens specially designed for her.. Whether in the office or at school, stay stylish at work with this stunning Crystalline Stylus Ballpoint Pens from Lanier. These pens are very similar to the Swarovski Crystalline Stylus Ballpoint Pens, both pretty and functional, with a smooth ballpoint at one end and a stylus on the other. These Crystalline Stylus Ballpoint Pens spells pure feminine elegance. The body is filled with sparkling crystals. Crystalline Stylus Ballpoint Pens are filled with lab-created crystals. The target audience is women. 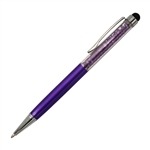 The shaft is a good length for someone with small hands, allowing precise control of writing. Despite all of its feminine charms, the Crystalline Stylus Ballpoint Pen is impressive enough they'd consider writing with it. Available in 6 different colors Aqua, Silver, Pearl White, Gunmetal, Fuchsia & Purple with combination of crystal beads. This sleek Crystalline Stylus Ballpoint Pen blends functionality with feminine elegance. The body is filled with sparkling crystals, creating magnificent light reflections as you write. The Crystalline Stylus Ballpoint Pen has a stylus on 1 end for use your touchscreen devices and a traditional ballpoint pen on the other. It's perfect for when you're on the go and need to switch between jotting down notes and operating your device. The Crystalline Stylus Ballpoint Pens uses Schmidt 635 refills. The Schmidt 635 refill is the perfect refill. It's the standard D1 size and is offered in Black, Blue, Red and Green. These Schmidt 635 refills are easy to replace when they run out. You unscrew the cap of the pen, pull out the refill, and separate it from the little plastic cap on the end of the refill. You put the cap on the new refill, put it back in the pen, and screw it into place. A great gift for family and friends. 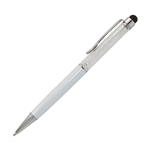 This sleek Crystalline Stylus Ballpoint Pen blends functionality with feminine elegance. . A wonderfully elegant and functional gift, perfect for every occasion.